It may not be logically sound, but it makes one hell of a weapon. Let’s say I’m running a war against creatures hellbent on destroying humanit. You come to me and ask, “Can we get some chainsaws on the front of our guns?” Functionally, an insane idea. However, practically, it works in Gears of War. The chainsaw gun, more commonly known as the Lancer, was the second iteration in a series of rifles utilized by the Coalition of Ordered Governments (COG). The original Lancer was developed and used as the standard-issue weapon by the COG forces during the Pendulum Wars. Respected for its reliability and stopping power, the Mark 1 Lancer also had a blade-bayonet which could be used in combat to charge and impale enemies. But, when the Locust first surfaced on Emergence Day, the COG soldiers found the bayonet wasn’t effective against their new enemy. In most cases, the bayonet would simply snap off or break when used against the tough armor and hide of Locust troops, leaving the COG at a disadvantage. During the Battle of Jannermont, Tai Kaliso was forced to use an old power saw to engage the Locust forces swarming him and the rest of his unit. Upon their return to headquarters the idea of a portable chainsaw became a reality when Marcus passed the concept to his father, Adam Fenix. Quickly, the chainsaw version of the Lancer became the standard weapon for the COG soldiers in their fight against the Locust around Sera, allowing soldiers to engage in close quarters combat with Locust forces. Unlike its predecessor, the chainsaw bayonet wouldnt break when cutting through enemy troops and could even withstand the force of another chainsaw bearing down on them. Like any other weapon, it had a few drawbacks. Despite being very effective, the Chainsaw Bayonet required a great amount of skill to wield without killing a friendly solider or the operator. Like a normal chainsaw, it could also jam easily if not properly maintained. That said, the drawbacks never outweighed the benefits and general badass feeling the Lancer filled players with when literally cutting through enemy forces. 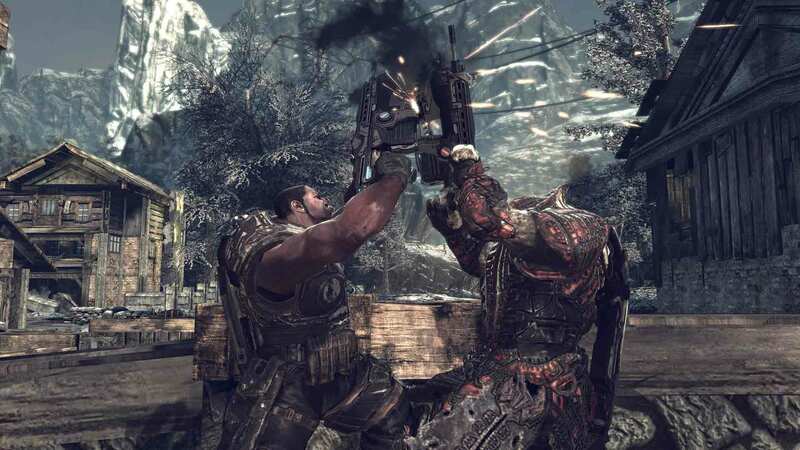 In the Gears of War universe, the weapon was actually so powerful that the Locust and Lambent took them to use against the COG. I’ll admit, I’m still a little upset I don’t know how the chainsaw has a seemingly endless power supply; but that hasn’t stopped players from giving the Lancer the unending respect it deserves.